Before we proceed, some things must be pointed out. A car seat is not necessarily a child restraint system. The seats that come with the vehicle are still car seats. As such, car seat organizers are not generally designed for baby car seats. Those that are, come with the car seat and are usually its integral part. Nevertheless, most backseat organizers do qualify as a baby product. The reason for that is that an organizer is usually attached to the back of a front seat. It should be very easy for the child to reach for it if he or she sits right behind the seat. It is only natural that some of the organizers’ designers do more than simply account for the possible presence of a child and actually do their best to make their travel experience better. Objects are not simply tightly secured but, in fact, are easily available. Some backseat storages are not necessarily organizers. Nevertheless, even phone holders, cup holders and headrest hooks for clothes are perfect both for children and for adults. Aside from backseat organizers, there still are some types of organizers and car seat storage devices available for the child’s comfort. One of them is the travel table. 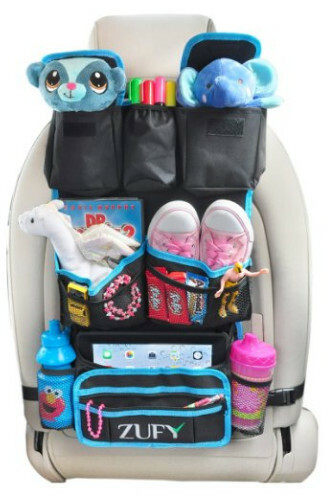 This type of car seat organizer is attached to the child car seat and, as the name suggests, is used as a table. As you can see, three types of car seat storage devices can be singled out. Backseat storages. Include organizers, hooks, cup holders, phone holders, and other similar things. 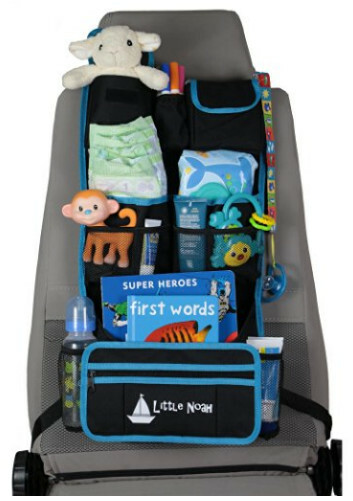 Child car seat built-in organizers and storages. It stands to reason any kind of storage or organizer is convenient. The question is, to what extent? When does an organizer cease to be useful and takes up more space than it saves? It is an obvious question but it is not that easy to answer. Generally. However, in the case of car seat organizers, the answer is much easier to produce. 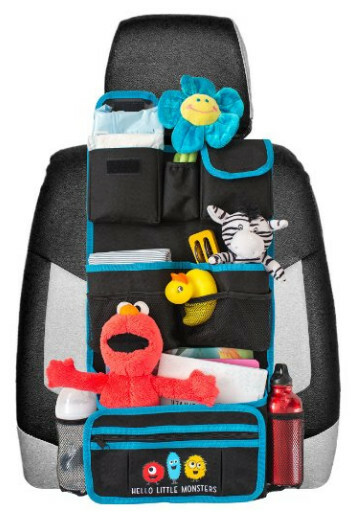 Most car seat organizer are similar to each other within their subtype and even outside of it. Most of them are applied to the back of the front seat anyway. What do you sacrifice in that case? What do you gain? Most of the time, you sacrifice very little space between the two seats. It might matter if you have a small car and the child car seat barely fits. In that case, purchasing a full-size organizer might be a bad idea. However, you could still get a shorter one. Headrest hooks, net storages, cup holders, and phone holders are very short, to begin with, and do not reach all the way down. Travel tables, however, might be a little unwieldy. 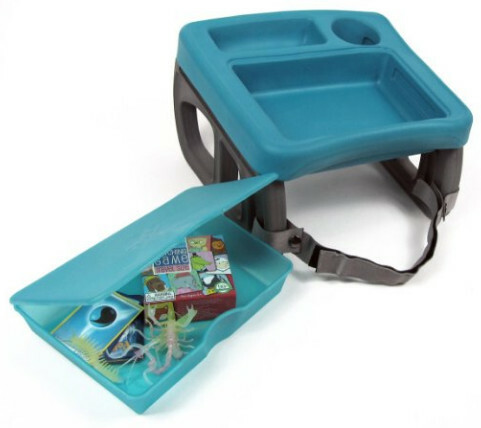 They are perfect for eating on the go or any other similar activity but they do take up space and limit the child’s movement in addition to the car seat itself. However, as long as that is not too much of a problem, a travel table is a perfect solution. Most of these tips are not something you would not have thought of by yourself. Nevertheless, they are not immediately obvious, not until you give it some consideration or attention. Make sure to not put any sharp and pointy object in the organizer. This is especially true for knives, forks, and similar objects. Even if you trust your child will not play with these sharp items, there is a slim possibility his or her head will run right into them in the event of a car crash. It is dangerous to keep anything sharp in a car seat organizer. Make sure you do not keep bulky and firm objects there—for that same reason. It is not very dangerous for a child to hit their head on a soft plushy toy. Hitting a laptop in a hard case is bad. Do not give any hot liquids to your little ones during the ride. You probably would never do that anyway but some people still forget to never do that. For that matter, do not store vacuum flasks with hot liquids anywhere near passengers, especially not in front of a child’s face. If the flask breaks, which is not impossible in a car crash, the liquid can easily scald the child’s skin. Do not place glass objects in front of a child’s face at all. This is dangerous and can lead to life-threatening lacerations, cuts, and gashes. 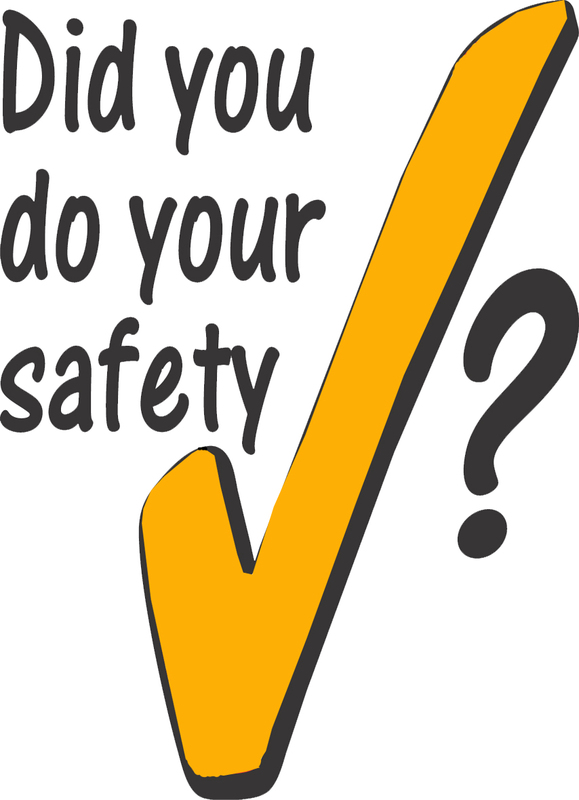 We also recommend that you account for the fact if your child still uses a car seat or not and, if yes, which type—in case the organizer might interfere with proper installation. This tray from Luvit is a cheap solution if you need a travel table. It does not cost much and it is easy to replace. That said, do not expect that it will need replacement anytime soon. 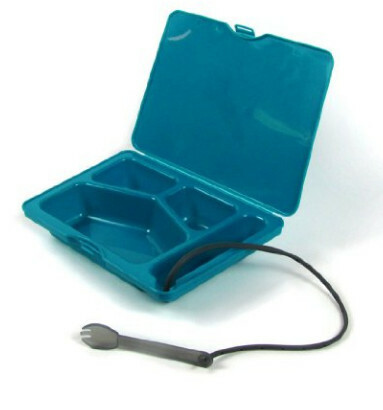 The Travel Tray Soft Table is extremely durable. Some people would consider its soft surface to be a disadvantage, and, indeed, it will be in most cases. You should probably avoid loading too much food and drinks onto it and account for the fact the drink will probably topple over after any sharp turn. However, it is also extremely safe due to being soft. The tray has a very large surface. We still do not recommend placing drinks there but it is perfect for most kind of food. The sides are raised to prevent it from falling off. The table is also compatible with strollers and car seats, including booster seats, and is very easy to install and remove. The table has pockets for extra storage. That makes it more than a simple tray. And for a reasonable price, too! Yet another cheap travel tray table although this one more of a lunchbox, just as the name suggests. It is made of relatively hard plastic and does not just fold up. The ZoomSNACK is made primarily for meals and drinks, and it is hard to use for anything other than that. That said, it is a perfect solution for drinks. You do not have to worry about them falling off and spilling their contents all over the car any longer. The product comes with a tethered sport. Even if you do not pack any utensils, your child will still have something to eat with. It should be noted, however, that the ZoomSNACK is not a travel table proper although it can be used standalone. Still, it is also a perfect match for a ZoomKIT travel table. It does not come with the ZoomSNACK and is to be bought separately. It is BPA and phthalates free and can be put in a dishwasher, microwave or a freezer without any worry. The product has been thoroughly tested. This time, you get a proper travel table, one that is not made of fabrics and is actually a table. Of course, it is also not cheap. Although non-comparable to the price of even the cheapest car seat, this ZoomKIT table does certainly cost some money. Especially if you consider the fact it can accommodate a ZoomSNACK Lunchbox. Additionally, you can install a ZoomART kit, not mentioned in this review, or any other modular insert from ZoomKIT, compatible with the table. You can purchase this table and start building your own travel table system from there. And it is compatible with most car seats, too! The ZoomKIT products are very lightweight, which is to be expected since the inserts are made of polypropylene. The basic system comprises one such insert, legs, and a hinged lid. The latter can be used for drawing, reading, it can be used for stickers and similar things. It may be a costly purchase but it is completely justified. Not only will you get a ready-to-go organizer table, it will also have to potential to be improved thanks to the modular design. If using a tablet is a good idea to entertain your child, you will love this particular organizer. After all, it includes a tablet holder. Not only that, it is designed around it. The tablet holder is this organizer’s primary feature. This organizer can hold tablets up 10 10.1 inches. The brand or operating system do not matters, it works perfectly both for iOS and Android tablets. Be advised, however, it can only hold tablets that big only in the portrait position. If you want to use yours in the landscape position, you have to make sure the tablet holder can accommodate it before buying the organizer. You should also know that the pocket can cause glare if the light fall at an angle since it is made of plastic and not any optics-grade material. The organizer is a good fit for a small car and takes very little space. The tablet holder, of course, can be used to hold different things, not necessarily a tablet. It can hold documents, DVD discs, thin books and e-books, phones, and other similar objects. But the tablet holder is not the only thing the organizer has. It also comes with four mesh pockets and one polyester pocket. The latter is well suited for storing books, toiletries, crayon and bulky items in general. This organizer also doubles as a car seat protector since it protects the back of the seat from spills and stains. It is also easy to clean and very cheap. 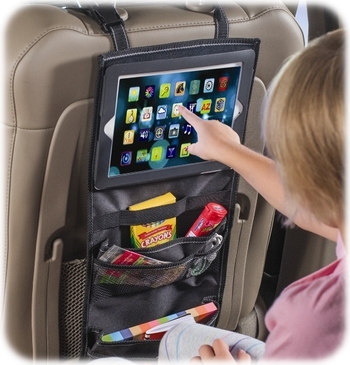 The Little Noah Backseat Car Organizer is not quite as tidy as some others. It also not suited for a tablet, although it can still hold one as any other item. It simply not possible to interact with it while it is secured there. That said, the Little Noah organizer offers a lot. 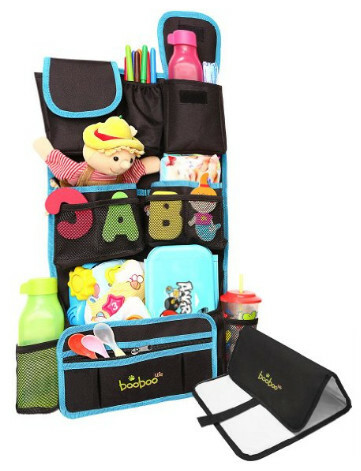 It has a number of pockets, including two outside mesh bottle holders and a secret pouch on the back, which is attached to the organizer using Velcro. 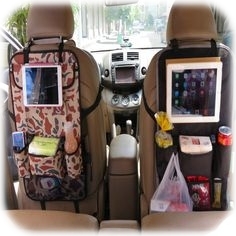 The organizer is very easy to install, it only requires two straps around the seat. It does not take too much time. When installed, it can serve a perfect replacement for (or a supplement to) a car seat protector. The Little Noah organizer is extremely durable. Of course, it only covers the back, which is why we suggest using a proper car seat protector. The organizer is made of eco-friendly materials and easy to clean since it is waterproof. It is also very lightweight. All of that, combined with its relatively low price, makes it a perfect budget organizer for those who want easy access to a least a dozen objects, all the while keeping the car tidy. Car seat organizers are not generally expensive. On the contrary, most of them are quite cheap. However, this particular one from booboo USA is cheaper than most of them. Of course, you cannot get too much for the price but you would be surprised to find out just how much you could still get out of this deal. 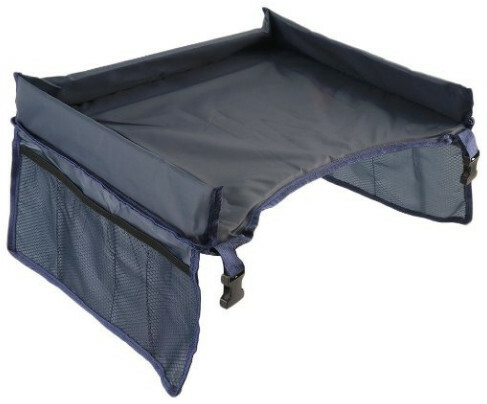 First of all, this organizer is more durable than its competitors. It is made from Reach certified materials, is stain-resistant and water-repellent. As such, it is certainly suitable to double as a car seat protector. However, that by no means is its main function. Second, the set includes the booboo USA Deluxe Portable Baby Change Mat. This, too, is only a complimentary item and not the reason you should purchase this organizer. The true reason why many people prefer this organizer is that it comes with a great number of pockets. This booboo USA organizer has more pockets than ever before, more pockets than most competitors can possibly offer. That includes zip-compartments, bottle holders, flap fold storage pockets and much more. Whatever your child is going to need during the ride, it can probably fit in there. 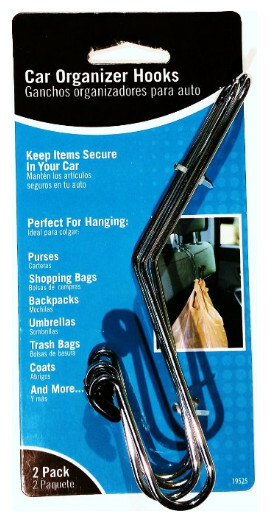 A perfect purchase to keep the car tidy if you might need to get anything during the ride, from hairbrushes to phones. However, the bottle holders are somewhat small. What makes a well-balanced organizer? Pockets. Durability. Tidiness. Easy installation. That should be it. Hello Little Monsters know this as well. Their backseat organizer is a perfect embodiment of those principles. The organizer comes with exactly 15 pockets. It might be less than some other organizers but it is still much more than yet some. Not enough? Not to worry, there are two extra on the side for bottles, essentials, and other things. There is also a detachable pocket for documents. Alternatively, it can be used as a wallet. The installation is very easy and does not take much time at all. What is more important, this product is compatible with most vehicles, including trucks, vans, and other, to say nothing of cars and SUVs. The seat organizer is also extremely easy to wash, just like most of the best ones. Much like them, it can double as a car seat protector. The Hello Little Monster organizer is a perfect choice if you want your child to have access to all their toys. What makes this organizer special? It is hard to say. However, know this: even trying to find at least some cons might cause a headache if you seriously put your mind to it. Even if you will somehow end up unhappy with this product because it simply does not suit your taste, you will still get a full refund. On top of that, you get a free eBook and tire pressure gauge. The Zufy organizer has a great number of pouches enough for anything your child—and you—might need. Most of the pockets are made of mesh, which makes looking for anything you might need much easier. It is rather hard to get something lost if it can be seen at all times. That said, the organizer has an extra mesh pocket located on the back wall of the organizer. It is meant for any items that will not be possibly needed during the ride. This organizer has the potential to eliminate the need for backpacks and travel bags if you are traveling somewhere far. Of course, you can still take them along if you want to pack even more items than usual. Easy to install, easy to remove, easy to wash, this product offers a perfect way to save you all the trouble. It is also made of eco-friendly materials and super-durable. The free Gaming eBook alone might not be the deciding factor. 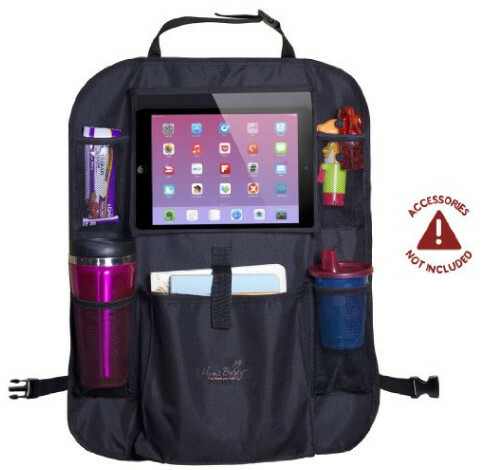 But combine it with the sheer number of pockets, the hidden pocket and the organizer’s ability to accommodate a number of toys as well as typical travel essentials, and you will get a perfect product. Sometimes, a proper organizer is simply not needed. After all, if all you want to accommodate is a tablet, why would your child need an organizer for that? A tablet holder would be a better choice. 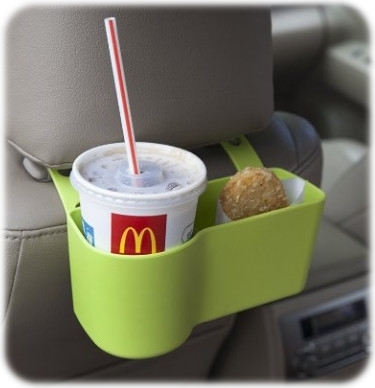 Or a cup holder if it is a drink that needs to be put somewhere (and the car seat comes without one). A hanger is the best choice if everything is already as tidy as it could possibly be if it were not for a jacket or any other item of clothing. With that in mind, we present you three best items, also used for organizing and storage. The Faguan Deals Car Seat Organizer does its job well. It is perfect for accommodating drinks and food, including fast-food. However, it is more than that. Yes, you can store food there, as well as coffee, Coke, and other drinks, but it can also store smartphones, baby supplies, toys and so on. There is no real limit other than the size and quantity. Sadly, this cup holder organizer is simply not big enough. Nevertheless, you can still use it for more than just storing food. A free compartment? Put what you need in there. No drink? Let your kid use it for pencils or a bottle of lotion. There are times when the size matters, but if not, you can just get this organizer and let your children enjoy themselves. Not very much can be said about hanger hooks in general or these ones in particular. They are perfect for clothes, bags, and other similar items. You already know why you would need them. The only thing that makes them different from regular hooks is that these are attached to the headrest for the convenience of the passenger in the rear seat. Their age is not even important. Children and adults will surely find their uses. Crown Bolt has certainly made a good job. The hooks are easy to install, they should work with any headrest and they have rubber tips for your child’s safety. As long as you do not hang anything that weighs more than 11 pounds everything should be fine. The name says it all. This is indeed a universal holder. It works perfectly with phones, tablets, and e-books. The only limit is the size. 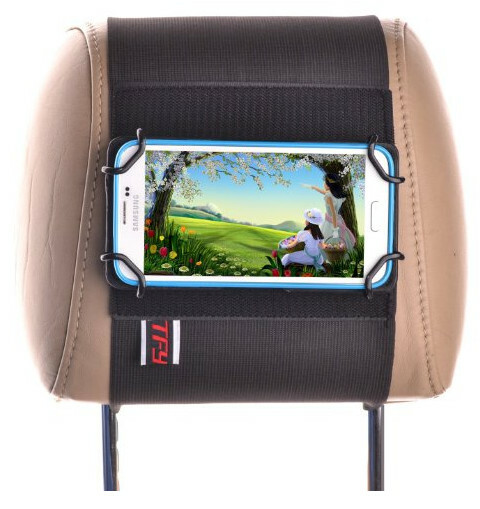 This headrest mount holder is suitable for devices between 4 and 11 inches. Installation does not take much time, similarly to the best car seat organizers. What is more important is the fact it is rather easy to both detach and reattach the phone or tablet, which is extremely convenient. It also has a very durable construction and expandable design, which allows the tablet holder withstand G-forces and be moved between vehicles. Be advised that the tablet holder works better with thin devices. It still works with thicker one, but not nearly as comfortable. Although you do not have to worry about it being broken because of that since it really is durable. The price is above average but if your kid likes to watch movies, this will be a perfect purchase.